I hadn’t planned on doing a Then & Now post today, but Hap Hazard just keeps sending great shots my way. So today we’re going to take a look at the area where the stadium is being built. Imagine yourself flying over the west end of campus looking towards the east. The top photo is from the CSU Archive and shows several landmarks. The series of eight over four white rectangles to the upper right are the Prospect Plaza Apartments. (You can find out more about them in this old Forgotten Fort Collins post — Then & Now: Aggie Village at CSU.) Just below those, towards the middle right of the photo, is Aggie Village North, which was just recently torn down and replaced. (But I used an older image here, from 2014, that still shows them.) And Aylesworth and Braiden Halls are to the bottom left in both images with Eddy Hall and the Education building just above them. There are, of course, some notable differences as well. 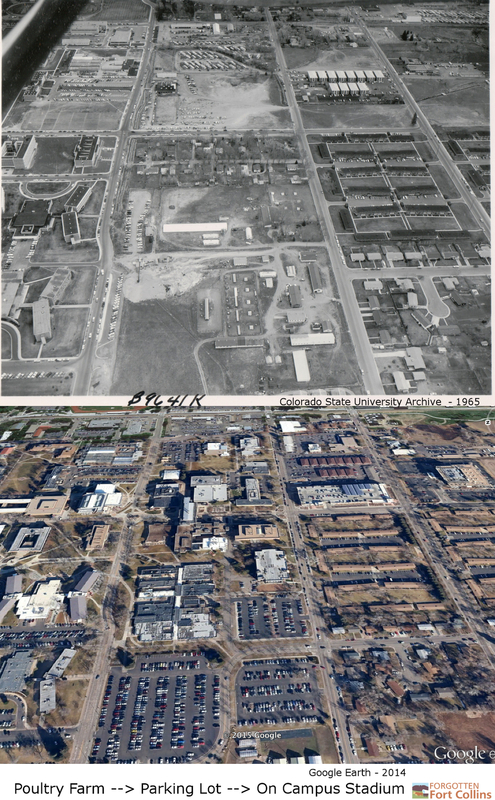 Where a very small neighborhood existed in 1965, shown at about the center of the older photo, now stands the Molecular and Radiological Biosciences building and the Chemistry building. There are numerous other changes. But the bottom center might be the most interesting to us today. That part of campus used to be the Poultry Farm, as seen in the top image. Most recently it’s been a parking lot, as seen in the bottom photo. But if you were to head over to that part of CSU today, you’d see work being done on the new on-campus stadium. 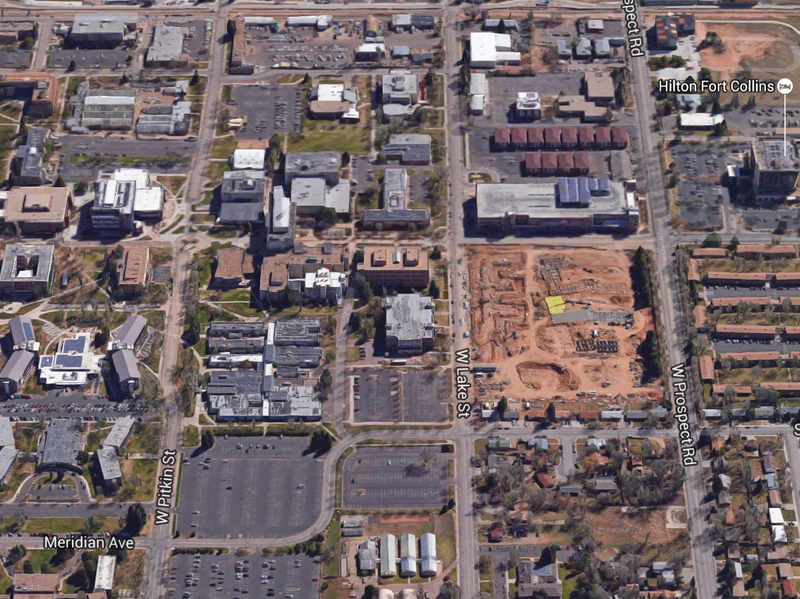 The more recent photo above was from Google Earth, which seems to flatten buildings out a bit. So here’s another shot of the same area via Google Maps. In this shot you can see the work on Aggie Village North underway. One other quick item of note, given my recent attendance at the Climate Action Plan open house this past Monday (as noted in today’s Pedal Fort Collins post), take a peak at the roof of Braiden Hall in this last photo (just down from center left). It’s covered with a solar array! Given the number of south facing and flat roofs on campus, this is a great idea and I’d love to hear more about what affect it’s having on CSU’s non-renewable energy use.